Originally, I tried to post a recipe for Sausage and Lentil soup from Finding Joy in My Kitchen but I had trouble with the formatting. I am sorry for the recipe post delay this week. 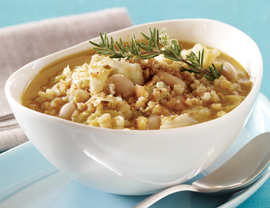 I hope this recipe for White Bean and Arborio Rice Soup from the Vegetarian Times. Soup seems to be appropriate today as the cool breeze and colder temps make it feel like fall (or autumn, depending where you are from). The recipe says the toasted breadcrumbs and pine nuts give a cheesy-flavor without the cheese (and therefore without the fat!). 1. Heat 2 Tbs. oil in pot over medium heat. Add rice, and sauté 6 minutes, or until toasted, stirring occasionally. 2. Stir in garlic and rosemary, and cook 2 minutes more. 3. Add broth, cabbage, and bay leaf; cover, and bring to a boil. Reduce heat to medium-low, and simmer 10 minutes. 4. Pulse bread and pine nuts in food processor until small crumbs form. 5. Heat remaining 1 Tbs. oil in skillet over medium heat. Add breadcrumb mixture, and sauté 5 minutes, or until breadcrumbs are crisp and toasted. 6. Add beans to soup, and cook 5 minutes more, or until rice is tender. 7. Remove bay leaf, and stir in breadcrumbs. Season with salt and pepper, if desired.